The WOW! factor. Every contestant needs it. Not all will achieve it. What will elevate you above the competition? In the world of pageants, contestants choose a philanthropic cause to which they’ll devote their year’s service. Their dedication to develop a successful platform can make the difference between being first runner up and wearing the crown at the end of the pageant. Whatever platform you choose, you have to bring it … Own it with passion and enthusiasm. One of the most compelling tools to leverage your platform is a book. As you’ll be spending a lot of time talking to children, young people, and adults, nothing helps you translate your passion and demonstrate your expertise like a professionally published book. 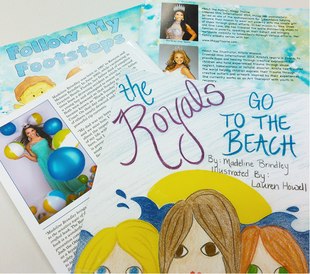 Madeline Brindley, Miss Conway’s Outstanding Teen 2014, shares her passion about water safety with her children’s book called The Royals Go to the Beach. Madeline and her family were vacationing in Florida when her father made a daring rescue of a little boy who was caught in a rip current. Upon returning to the rip tide to save the boy’s father, Madeline’s dad was also overcome by the current and both men drowned. Madeline used this tragedy to inspire her platform, “Wise Water Safety,” and then into a book to share swimming safety lessons and information about rip currents with children and families. She especially enjoys speaking at schools to share her book and safety lessons with youngsters, often giving copies to their libraries and teachers to use in class. Proceeds from sales support water safety education programs around the country. Working with a local artist and by crowdsourcing funds, Madeline was able to raise the $6000 budget throughout her publishing process to have her book edited, designed, and printed. With the help of Redbrush, an indie-publishing and book printing company in Lincoln, Nebraska, Madeline and her mother, Melanie, were easily navigated through the process of making this princess’s dream a reality. "When books arrived at my home, I opened a box and held my book. My dream of being an author became a reality. Redbrush printed a quality book that I am proud of. Choosing to indie-publish has given me control over all parts of my publishing process. Phil Whitmarsh’s encouragement, expertise, and knowledge gave me the confidence to complete my publishing dream. My mother and I were pleased with the experience and service we received at every step of our indie-publishing journey." Printed books and eBook editions can also be easily distributed through major retailers, expanding the author’s reach beyond the audiences they personally meet. Marketing their platform through various social media accounts, today’s pageant contestants can elevate their reach and impact throughout the country and around the world. Using a book as the delivery product helps their message resonate for longer periods of time than a speaking engagement alone. Learn more about turning your ideas, platform, and even blog posts into impacting books by contacting Redbrush. Redbrush offers a complimentary publishing guide through their website at www.Redbrush.com.